Thorne & Moorends Remembrance Service and Parade will take place on Sunday 11th November 2018 at Thorne Memorial Park, South Parade, Thorne and St. Nicholas Parish Church, Stonegate, Thorne. The Service and Parade will start to assemble at 10.30am in Thorne Memorial Park. Rev. David Green will lead a short service (10.45am) which will be followed by a two minute silence at 11.00am. At 11.30am following wreath laying, the parade will march to St. Nicholas Church where the Remembrance Service will take place at 12.00 noon. Please open the link below to download a copy of this year's Order of Service. 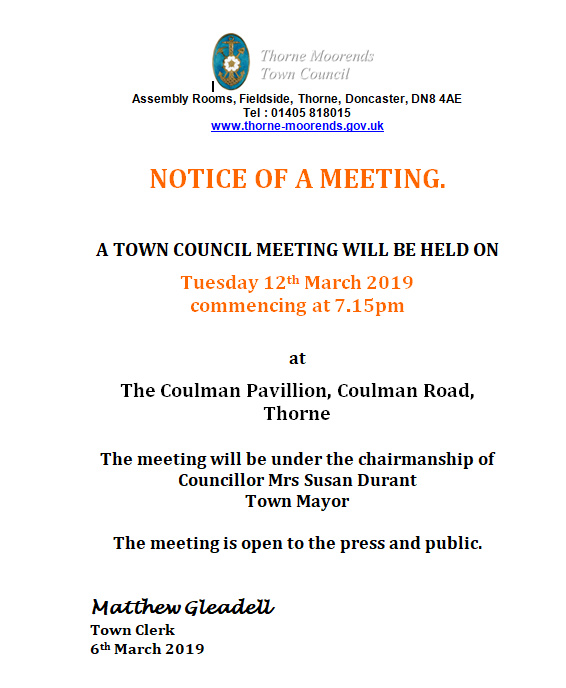 One Casual Vacancy exists for the Thorne Ward. Please see Notices of Casual Vacancy file and eligibility criteria below. One Casual Vacancy exists for the Moorends Ward. Please see Notices of Casual Vacancy file attached. 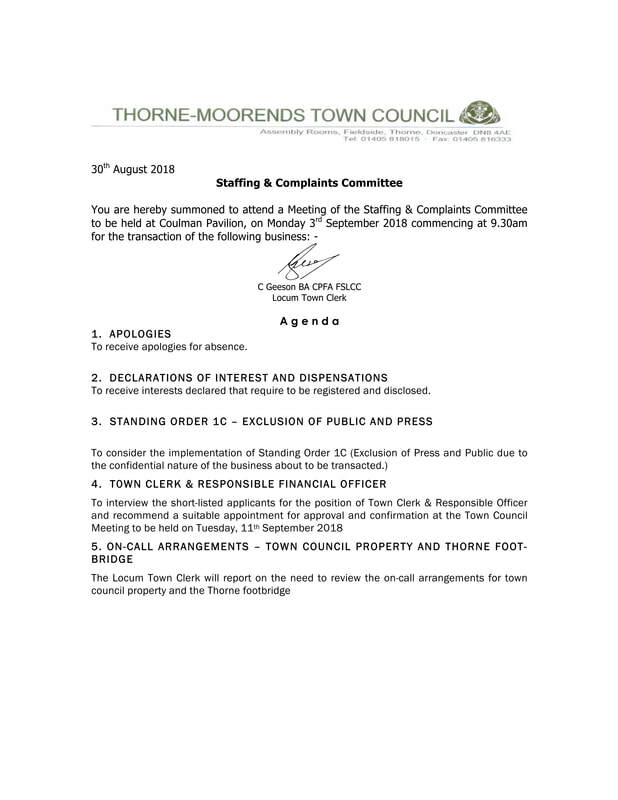 Due to Staff Training, Thorne-Moorends Town Council Offices will be closed to the public on Tuesday 24th July, Wednesday 25th July and Thursday 26th July 2018. Normal services will resume on Friday 27th July. 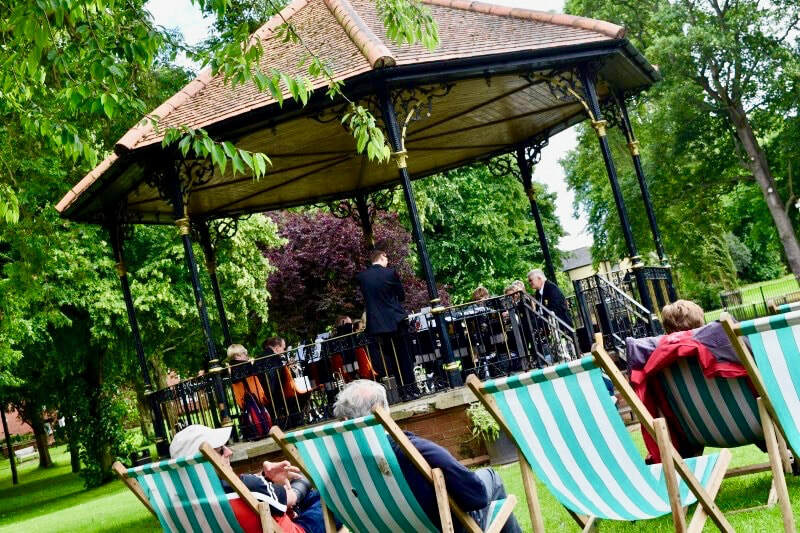 The Summer Band Concerts held in Thorne Memorial Park will begin on Sunday 8th July. Markham Main Band will be the first to play for us. So come along and enjoy the music! A schedule of concerts can be found by clicking on the file below. 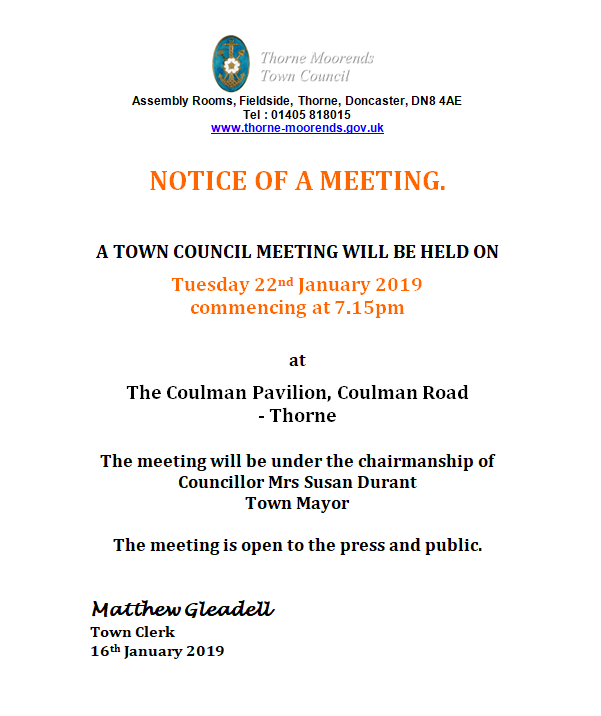 One Casual Vacancy exists ​ for the Thorne Town Ward. Please see Notices of Casual Vacancy in the file attached. The Council is inviting expressions of interest from anyone interested in being considered for co-option as a Thorne-Moorends Town Councillor. One for the Thorne Town Ward and one for Moorends Ward. Please click on the attachments below for further details. Two Casual Vacancies exist. One in the Thorne Town Ward and one in the Moorends Ward. 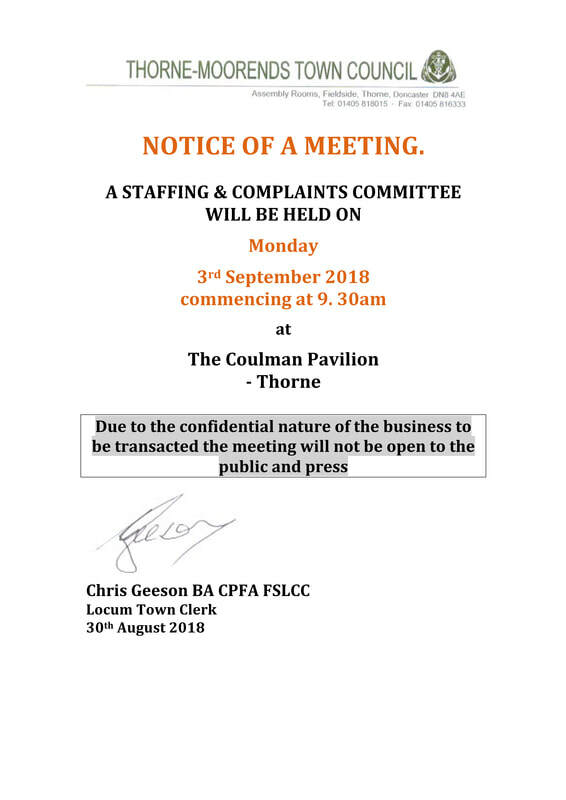 See the Notices of Casual Vacancy in the file below. There will be an election on Thursday 13th July 2017 to elect a Councillor for the Thorne Ward. 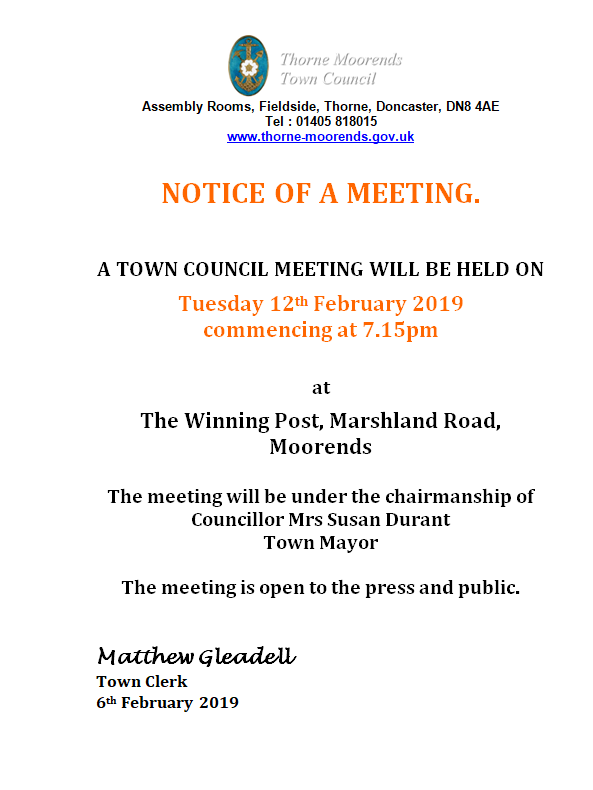 Please note Polling Cards will not be issued on this occasion. Electors registered in the Thorne Ward are asked to go along to their usual polling station on this day. For a list of people who have been or stand nominated for election for the Thorne Ward please open the file below. The Town Council seeks a highly motivated, enthusiastic person to take on the post of Locum Clerk to the Council. 37 hours per week. Salary in accordance with recommendations of the National Association of Local Councils. Duties include: acting as advisor to the Council; minute taking; compilation of correspondence, (ability to use email is necessary); filing accounts. Previous local government experience is desirable. 2.DELIVERY OF NOMINATION PAPERS Nomination papers must be delivered to Electoral Services, Civic Office, Waterdale, Doncaster DN1 3BU, from the date of this notice, on Monday to Friday between 10:00am and 4:00pm but no later than ​4 pm on Friday, 16th June 2017. 3.DATE OF POLL If any election is contested the poll will take place on ​Thursday, 13th July 2017. 4.​APPLICATIONS FOR REGISTRATION AND FOR POSTAL/PROXY VOTING​ If they are to be effective for this election: Applications for electoral registration must reach the Electoral Registration Officer by 5 pm on Tuesday 27th June 2017. ​​​New applications to vote post must reach the Electoral Registration Officer by 5 pm Wednesday 28th June 2017. Applications to amend or cancel existing postal or proxy voting arrangements must reach the Electoral Registration by 5 pm on Wednesday 28th June 2017. New applications to vote by proxy at this election must reach the Electoral Registration Officer by 5 pm Wednesday 5th July 2017 except in certain cases where illness, incapacity or matters relating to occupation, service or employment occur after that time, in which case duly attested applications may be made up until 5 pm on Thursday 13th July 2017. A meeting of the Planning and Amenities Committee will take place at 6.30pm, on Tuesday 13th June 2017 at The Assembly Rooms, Fieldside, Thorne. An Extraordinary Meeting of the Council will take place at 6.30pm, on Tuesday 6th June 2017 at The Assembly Rooms, Fieldside, Thorne. ​The Agenda can be downloaded here. 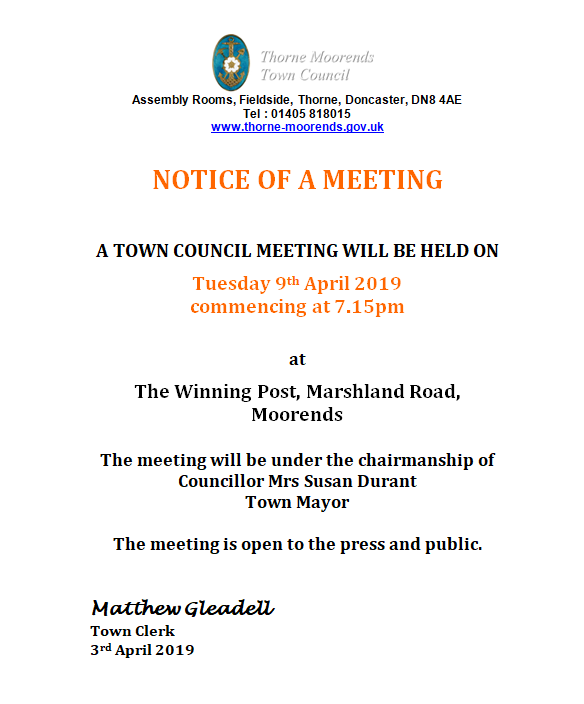 The Annual Meeting of Thorne-Moorends Town Council will take place at 6.30pm, on Tuesday 30th May 2017 at The Assembly Rooms, Fieldside, Thorne. 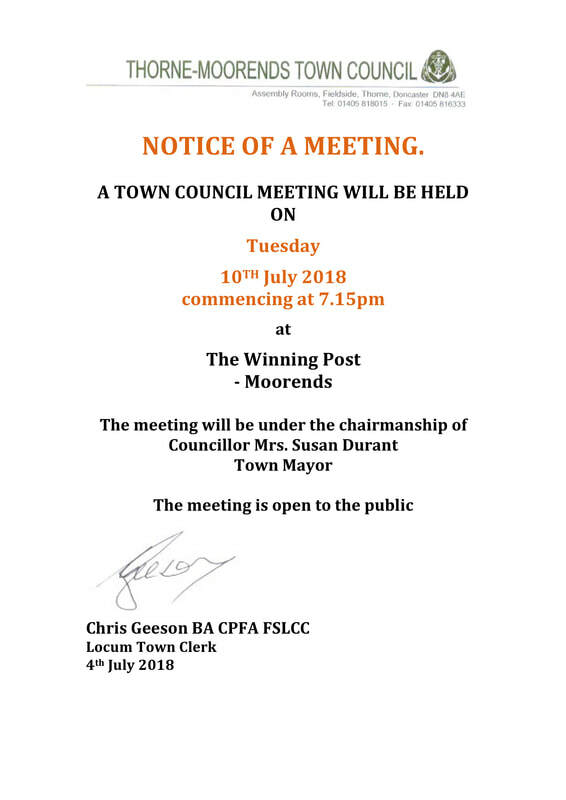 The Annual Town Meeting of Thorne Moorends will now take place on Thursday 1st June 2017 at Moorends Community Centre, Garden Road, Moorends, at 7.00pm and not 23rd May as previously proposed. 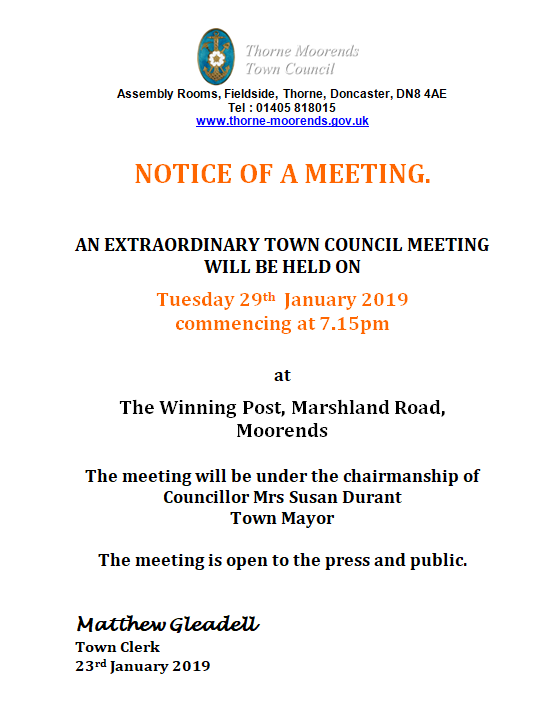 The date of the meeting has been changed to ensure that staff are available to support the meeting. Thorne-Moorends Town Council has approved an investment of £184,000 to enhance sports facilities at Moorends Welfare Recreation Ground. The funding will allow the refurbishment of the Changing Rooms Pavilion, floodlights for Thorne Colliery FC, and spectator facilities for Moorends Marauders FC. The works to the Pavilion are supported by a £50,000 Sport England grant. They will significantly improve the changing facilities which are currently poor, provide additional changing space, and improve the external appearance. The works will start on 23rd March and are due to be completed in May. The provision of floodlights will give the opportunity for Thorne Colliery FC to progress higher in then league structure. It will also create an area which will allow evening training in winter that can be used by a variety of local clubs. A Stand will be added to Moorends Marauders ground to provide covered spectator facilities. The Council has also approved the development of a number of additional projects to enhance the Recreation Ground facilities. Thorne Moorends Town Council has agreed to maintain the level of precept for 2017-18 at the same level as last year. The Council considered some inflationary pressures, but decided that it was possible to accommodate these without increasing the burden on Council Tax payers. The Precept collected by the Town Council covers a variety of local services including local community buildings, parks and sports grounds, the cemetery, local events and the Christmas Lights. This will represent around £1.16 per week for a Band A taxpayer next year. 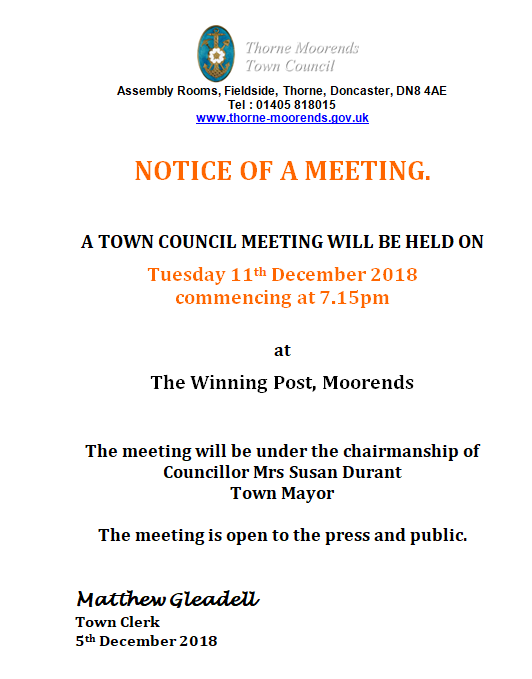 The local precept represents a small part of the Council Tax bill which includes costs of Doncaster MBC, the Police and Fire Services. The approved Council budget for 2017-18 can be viewed here. Revised charges for 2017-18 for Halls, Sports Pitches and Burials are available here. The Final Draft of the Thorne and Moorends Neighbourhood Plan is now available on www.tmplan.org/finaldraft for a 6 week consulation period up to 12th December 2016. The Council's Annual return for 2015-16 has now been subject to External Audit and a copy of the final version is available under The Council - Council Information. A full set of documents for the Planning Application that is being submitted to Doncaster MBC for the above site has been provided to the Town Council by the applicant and is available for inspection at the Assembly Rooms, Fieldside, Thorne. If you wish to inspect them please contact the Council on 01405 818015. Any comments regarding the application will need to be submitted to the Planning Department at Doncaster MBC. 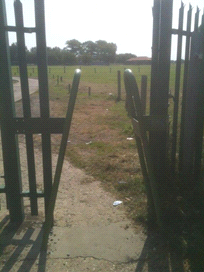 Following a recent public consultation regarding changes to the gates at the Welfare Ground to address problems for access by mobility scooters a decision the Council has decided to retain the anti-motorcycle barriers. Whilst the Council would wish to make the Recreation Ground accessible to all, the anti-social behaviour by a minority requires measures to be put in place to control motorcycle use on the site. The fencing and barriers that the Council invested in a number of years ago were felt necessary at the time, and circumstances have not substantially changed. Whilst current measures are not fully successful their removal would open the site up to more misuse which is causing distress to neighbouring properties and other site users. Some daytime access is available for mobility scooters when authorised users are on site. At the Annual Town Council Meeting on 10th May the Council elected Cllr Susan Durant as the Town Mayor for 2016-17, and Cllr Mark Houlbrook as Deputy Mayor. The Town Council have agreed with a newly established group “Thorne Town Community Angling” that they will take over the management of the Delves and the Canal fishing from 2nd May. The new group has been formed from the Thorne Democratic Anglers Club, and all are members of the local community who wish to see the facilities well run to the benefit of local people. The café on the Delves site will also continue to operate unchanged providing refreshments for anglers, local residents and visitors to the Town. The group will take over from the Thorne and District Anglers Association who have disbanded. The Town Council wishes to thank this group for the excellent work that they have done over the many years that they have looked after these facilities. The Town Council originally acquired the Delves and the Fishing Rights as community facilities, with the Delves also having an important role as an attractive area of amenity land at a gateway to Thorne. A number of approaches were received with regard to future management, but the Council were pleased to maintain the arrangement that the site is managed locally. Whilst a new group, Thorne Town Community Anglers will include members with extensive angling experience, as well as knowledge of how to run a local society, and the Council is confident that they will be able to maintain the services to the local community. "The Tween Bridge Wind Farm Community Benefit fund has now been running for a while and the donor, E-on, have asked us to work with the community to identify a one off capital project which offers real scope to enhance the community facilities within the Thorne & Moorends area. If your group owns its own building, or has a long lease and is seeking to enhance the facilities for the local community, speak to us about a capital grant of up to £25,000. In the first instance ring Karen Walke on 0114 2429005 on Tuesday – Thursday to discuss your ideas."